It is a perfect English morning, “one of those dazzling days in early April when a new sun makes it seem suddenly like a full-blown summer” when we are introduced to eleven-year old Flavia de Luce. She and her family are at the train station in the village of Bishop’s Lacey awaiting the return of her long-lost mother Harriet. Upon the train’s arrival Flavia is approached by a tall stranger who whispers a cryptic message into her ear. Moments later, he is dead, mysteriously “pushed” under the train by someone in the crowd. This is just the first of a series of events that puts Flavia’s sleuthing skills to the test. Following a trail of clues sparked by the discovery of a film reel stashed away in the attic, she unravels the secrets of the de Luce clan, involving none other than Winston Churchill himself. Originality and attention to detail are the book’s strength as Alan Bradley manages to keep us engaged in Flavia’s sleuthing adventures. 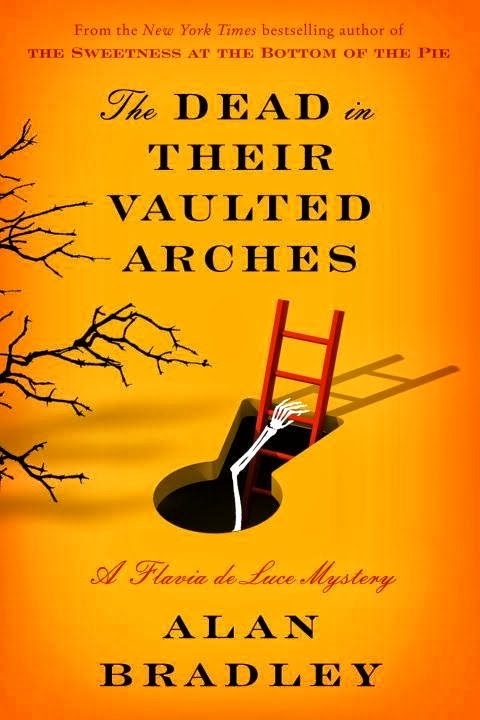 Surprisingly, The Dead in Their Vaulted Arches doesn’t feel like a book for a younger reader – Flavia after all is only eleven years old. She is more than a post World War II British Nancy Drew; she is a young sleuth with her own identity. The Dead in Their Vaulted Arches entertains and delights.